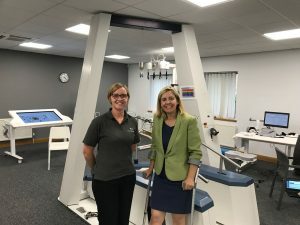 On Wednesday 8th August 2018, Andrea Jenkyns MP for Morley and Outwood came to visit MOTIONrehab’s Intensive Neurological Rehabilitation Centre in Leeds. Clinical Director, Sarah Daniel had the pleasure of showing Andrea around the new centre. Andrea spent time talking to MOTIONrehab’s patients and seeing first hand how MOTIONrehab’s rehabilitation technology facilitates high-intensity neurological rehabilitation. MOTIONrehab is the only neurological rehabilitation centre in the country to offer patients intensive neurological rehabilitation with specialist one-to-one hands-on therapy from experienced and highly skilled clinicians. Uniquely MOTIONrehab clients also spend time training with the robotic and virtual reality devices individually and in groups. This allows MOTIONrehab patients to practice high-repetitions of movement which is critical to neuro-plasticity and the optimisation of outcomes.